More mators in the ground. I planted 4 more tomatoes today. Everyone around here is waiting for next week, it being the last frost date. It's gonna be nice all weeks with lows in the mid 50's so why not, why wait a week. Hell I should have planted more a few weeks ago, this month is supposed to be good for us. Though there is talk about a possible frost late April early May. But this boy aint waiting that long. My plants won't wait that long either. Never fear I still have plenty of "just in case plants" some are just now sprouting. And the Blind Melon I'm listening to now tells me everything is gonna be okay. LOL you are in plants and seedlings all the way up to your eyeballs, aren't you Dono? Way to go, June maters I see in the future!!! Spent entire day yesterday building and filling 6 more raised beds, today - next 2nd batch of maters went into the ground. Much like you, weather promising to be nice for at least weak and a half. So hoping for the best. Few days ago though - we did have a mild frost, all the windows of the cars were frozen, but 10 early maters in containers are still doing fine - black 46gal plastic bags work like a charm! Warmed up soil from the heat of the day just filled the bag the "plant saving" environment! All in bloom! Yes DV I am up to my eyeballs in plants. I have a few tomatoes kicking on the black cherry's. Though there are a llot of flowers on most of them. Like you said hope for the best. SOunds like you are doing good as well. Good to hear. I have 4 of your Spriodonovskie's in big pots. Plus many others from you grwoing still. I just had a few srprouts of the seeds Roger sent out. Plus many other extras growing good. I can't wait. I was going to take some pics today but just didn't get around to it. I have a bunch of stuff growing. Gotta go now and go to sleep it has been a long day. I protest! You can't be 5b and not be expecting anything lower than 50Ã‚ÂºF! It's false advertising... or something. I'm looking at 38/36Ã‚ÂºF for Tuesday low here. Never the less, you guys are pushing me into taking chances. When you have a 75Ã‚ÂºF afternoon with 110Ã‚ÂºF in the sun, you can't help thinking it's got to be OK. So I planted 3 of my June racers. 1@ Moskvich, Moskvich, Jr., and Yellow Bell -- all 60 days. Here they are in my crowded and weedy 4'x4' bed. 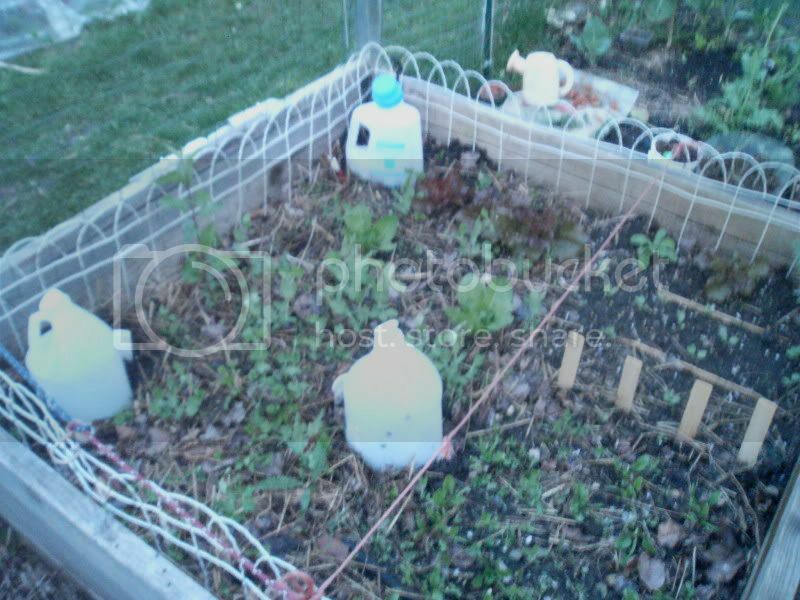 It a bit blurry but I planted them in the bare spots where the peas didn't come up. I need to thin the spinach in the near corner, big leaves are lettuce, and markers indicate carrot area with radishes to break up the crust. Most of the scattered little greens are cilantro, with some other stuff -- lamb's quarters, looks like carrots and some kind of crucifer -- could be Cauliflower or a Romanesco, and an apple seedling in the center of the far wall. Tonight's low is 47/45Ã‚ÂºF and tomorrow's is 41/39Ã‚ÂºF. So the toms are wearing their 'caps. I'm sorry Apps but I just looked agian at the 10 day. It says a couple of nights to get down around 46 than 49 and above for the rest. Mid 60's or above for the day's. I can't complain with that. Actuall everyone around here is thinking next week for "The Day". I wish I could send you some warm weather but don't that would work. It's 80 degrees right now and 5:00 pm. Sorry to hear you peas aren't coming up, mine are going gangbusters, just out of the ground though. If only I could my lettuce and spinach, carrots etc to do anything. I think it has been to damn warm lately, I wish it would cool off a bit. This isn't natural. I need to get some pics I have been very busy lately. Going to my boy's baseball game in 15.
gixxer- I am a newb to the forum and just relocated to an area pretty close to you. We're putting our tomatoes in later this afternoon and hoping for the best. I do see a couple of lows in the mid-40s predicted but I'm hoping it doesn't go too much below that! If we don't get them in this week we'll have to wait another 2 weeks so I guess we'd better just go for it. (We're planting them at my grandma's since we don't have a yard). I'm glad to know there are other gardeners on here in my area, I haven't had a garden in about 10 years so I feel like I'm starting fresh again. Gix: Awesome! I'm glad I'm not the only one trying to outwit Mother Nature this Spring! More than half of mine are outside already & have been hardened off for about 9-10 days. Gotta keep a close eye on the forecast for the nest 2 weeks or so though! Welcome Nichole It's good to have someone close by for me as well. My neighbor platned today most fo the people are planning for next weekend. I sure as hell hopw we don't have a late frost. But if it come I will protect them. I have I belive 10 plants in the ground right now with a bunch of backups ready to go. It was uppers 80's today agian tommorow. Than friday a chance of rain and a cool down, which I am wating for. Some of my cool weather platns are bolting it has been so warm here. They way I'm looking at it My plants are huge and if I get them in and they grow nice and strong, a light frost won't be so bad. Or at least that is what I hope. Should I try to hang on to my mators? I'm gonna go for it and plant me some mators. I put 'em in the ground today!